This is our FAVORITE pumpkin patch. We've come here every year since the kids were very young. The place is huge and, big bonus, compared to all the other places around, the pumpkins are cheap! They do a flat rate of one price for large and one price for small. There is no weighing and guessing as you approach the scale....oooh, how much is it going to be this time???? If you get a pumpkin bigger than a pie pumpkin, it's considered big. There are so many to choose from sometimes it's difficult to know where to begin. You can bring a wagon or just drive down to a spot you like and pick one out. If it's been a very wet year, the weeds can be overwhelming, but most times it's just fine. They also sell fall decor like Indian corn and gourds. The kids always like to pick out a gourd and at prices less than a dollar, we indulge them! 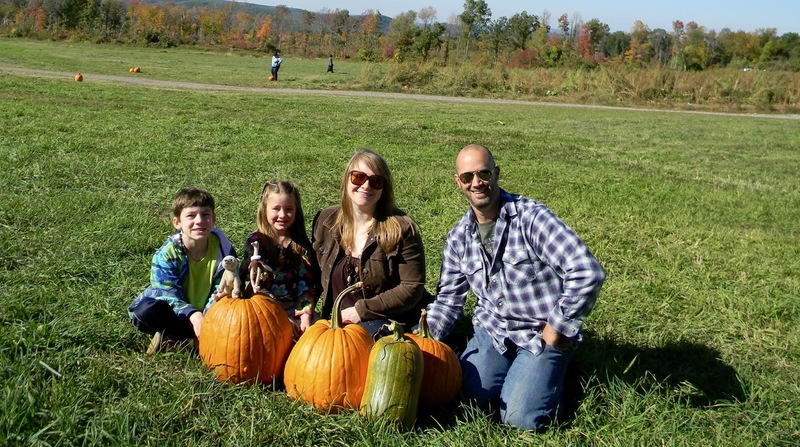 After we pick pumpkins, we head over to the counter to buy some goat food in ice cream cones. Sometimes the goats get feisty, but if you feed them with an open hand or right from the cone it's all good. After some good old fashioned fun feeding the goats we round things out with some homemade ice cream. My favorite to buy at this time of year is the pumpkin ice cream. It is delicious! When we are done with our ice cream the kids usually play on the climbing equipment for a little bit before we head home with our pumpkins. And you can't deny the pumpkin patch makes the perfect photo opportunity! Here's the patch we like to visit: Westview Farms Creamery. But if you're not in Massachusetts, I'm sure there is a great place near you!